The elderflower is a lovely, delicate flavour with a hint of champagne–y-ness class to it, paired beautifully with white tea this creates a warmly comforting herbaceous malty background note. 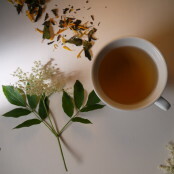 White peony tea blended with the delicate flavour of elderflower and decorated with pretty marigold blossoms, a sophisticated flavour, with a peachy, elderflower aroma this offers up a delicate blend will allow you to take that deep breath and relax. Perfect as an iced tea or with lemonade, also a perfect addition to that G&T you are dreaming of! Infuse one tea measure per pot, use freshly drawn boiled water, cooled to 70-80 degrees before brewing, brew for 2-5 minutes. Product : My favourite treat. White tea is difficult to find, and quite expensive, but worth it. Service rating : Easy to navigate website, swift delivery and great tea! Service rating : The service is excellent and fast delivery. 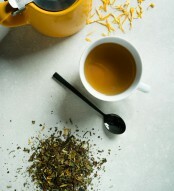 Product : This is my favourite tea. I really love the taste of it. Will defo buy this tea next time. I can highly recommend this tea. Thank you for the great review. A personal favourite of mine. Service rating : The tea was so good, but the delivery was not very fast. It took more than 5 days to get it delivered. I was so worried about if the parcel was missing.